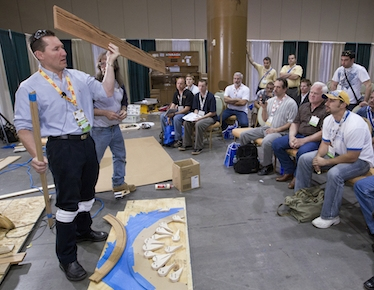 For over a quarter of a century the National Wood Flooring Association has been dedicated to training and educating hardwood flooring professionals from all over the world in the installation, sanding, finishing and sales of wood flooring products. Their members are educated on the latest products, services and trends in the industry. 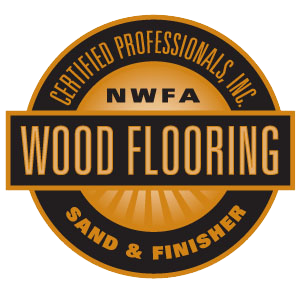 NWFA members possess the knowledge, skills, and professionalism to help you make informed decisions, and to deliver a beautiful floor that will last for the lifetime of your home. As NWFA members, we at Through the Woods bring these benefits to you. 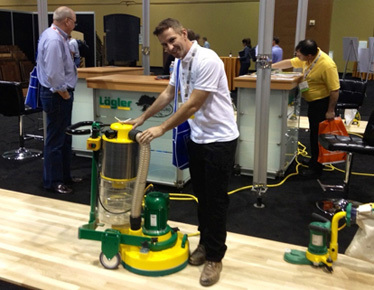 Chris at NWFA exhibitionAt the annual National Wood Flooring Association convention, we take the opportunity to familiarize ourselves with new products, products that have been approved by the NWFA for quality. Wood manufacturers from all over the world attend these conventions, allowing us access to some of the most unusual and beautiful woods from all points of the globe. We are always amazed at the palette of available colors and tones! Dealers show many woods from the United States, termed "domestic" woods, as well as "exotic" woods from every continent. Different growing conditions in these parts of the world result in woods that have a wonderful variety of color, grain pattern and other unique characteristics. Our showroom, open by appointment, reflects our many years of combing the world market for the most beautiful and unique wood floors that Mother Nature has created. You may be assured that the products there are durable, long-lasting and carry great value for the price. We stay on the alert for new, more durable finishes, paying special attention to products formulated to be earth-friendly. We recommend the use of Bona Kemi products and Through the Woods was chosen and specially trained by them as Bona Certified Craftsmen. We were introduced to oil finishes at an NWFA convention. These finishes, popular in Europe are durable and family friendly. Some of them are even no-VOC. By attending the convention, we can meet with manufacturers representatives, see the new products and learn how they should be applied. One of our specialties at Through the Woods is custom staining. Stain products are constantly being created in beautiful new colors and formulations which contribute to the evenness tone. Very dark floors are currently in vogue. Getting a smooth, even color can be a challenge. Using state-of-the art stains we can ensure you that your dark stained floor will be beautiful and long-lasting. Every year, there is something new and exciting presented in wood floor finishes. Each NWFA convention presents the newest discoveries in wood flooring. We attend these events to stay current in our industry so that we can provide homeowners with the best that it has to offer. New techniques are demonstrated by equipment manufacturers who are constantly striving to improve efficiency and quality. craftsmen. There is no other place to acquire this information which is always being updated and improved. Constantly striving to increase our customer satisfaction, we are always amazed by the quantity and quality of new developments in our industry. We are proud to bring these developments home to Tampa. Our craftsmen also greatly enjoy attending the convention. They have day-to-day knowledge of jobsite conditions are always striving to produce a higher quality floor. As the men on the job, we want to know their opinions about the new products displayed. They also have the opportunity to become further educated in the use of these products. Manufactures representatives are there to answer questions and demonstrate the use of their products. National Wood Flooring Convention We send our men to NWFA schools at their headquarters in St. Louis, Missouri so that they can learn techniques that will allow them to deliver higher quality floors. At these schools, they work with veteran craftsmen as well as industry experts to fine tune their already extensive skills. Returning to Tampa, they teach their fellow craftsmen what they have learned, keeping Through the Woods state-of-the-art in every aspect. When choosing a wood flooring professional, choose an NWFA member.